This is a sponsored post. As always all opinions are honest and solely mine. 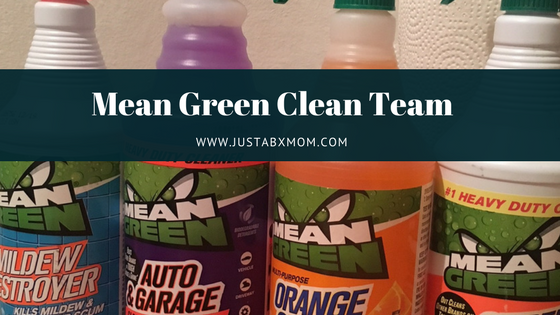 Woo Hoo, just in time for spring cleaning I have become a Mean Green Brand Ambassador. My first duty as a brand ambassador is to bring you a little Mean Green 101. I want to make sure before you head into your cleaning season that you are prepared. Mean Green has something for all of your cleaning needs. And yes, in and outside the house! Here are a few places that Mean Green has you covered. Something that I never paid attention to before becoming a part of the Mean Green team is that most cleaners suggest using doing a pre-cleaning before tackling tough areas. Mean Green doesn’t do this. I couldn’t believe it. I mean, really? Wait, I need to clean before I clean? Do I look like the type of together mom that can handle something like that? Seriously, I need cleaning to be as quick and painless as possible because I am juggling way too much stuff to have to clean something twice! When you use Mean Green products they are ready to get to work right away. And let me tell you that they do. I used the Mildew Destroyer earlier this afternoon in my bathroom and when I gave JustaBXgirl her bath this evening she said, “ooh mommy, I can still smell the clean.” My tub gets a lot of use. I was beginning to think the ring around it would be a permanent fixture. Oh, that’s just in my house? Either way, I didn’t even have to let the Mildew Destroyer sit for a while before it was getting the ring out. JustaBxgirl even asked me how I finished cleaning so quickly. Have you ever used Mean Green before? Does it sound like the type of product that would be helpful in your home? How cute is my little helper in this video? Wait? I’ve been cleaning for how many years and never knew about a pre-clean. I’ve been looking for a good degreaser for our electric stove top going to have to add that to my shopping list. Right? It kind of shocked me too! lol! Just a NX Girl’s smile and fist at the end of the video has me sold! It’s on the list for the next time I go shopping for cleaner this week! She loves a clean home. Guess who is buying new cleaning products now?